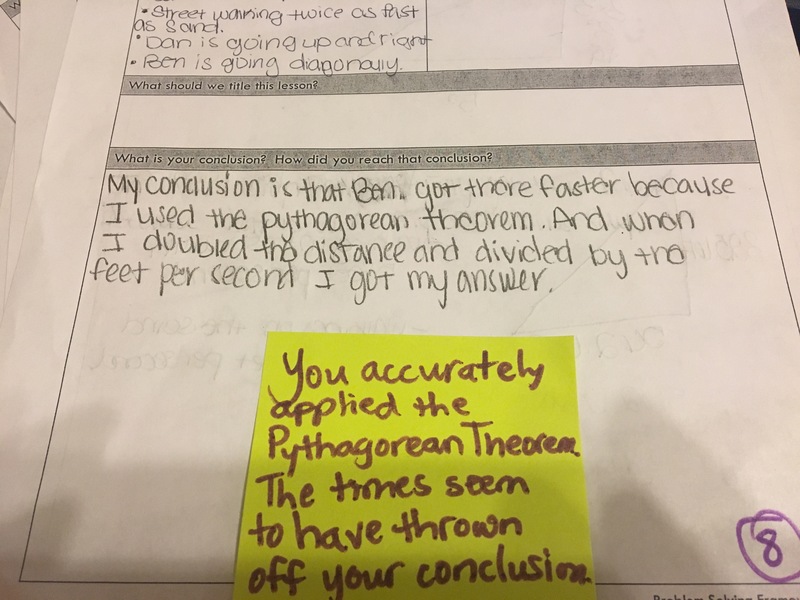 Our last unit ended with a bang! 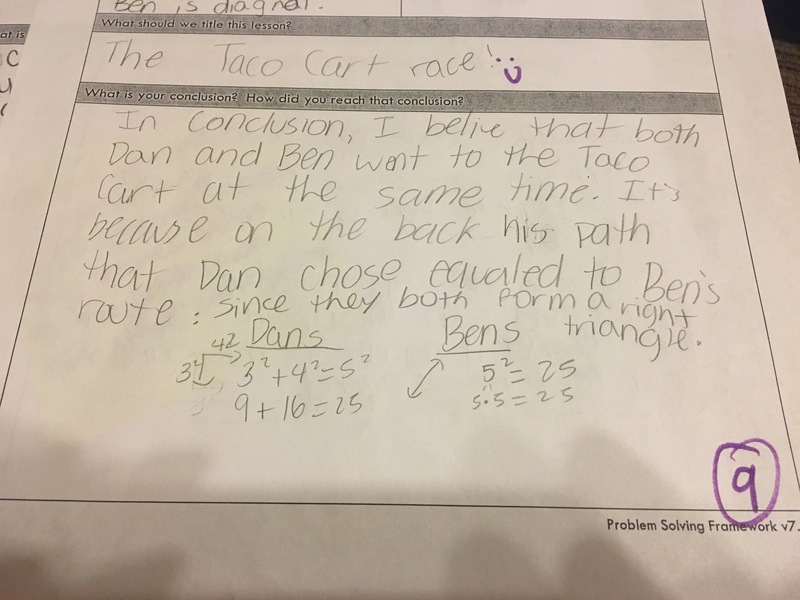 Unit 5 Pythagorean Theorem and Volume was opened with act 1 of Dan Meyer’s Taco Cart. 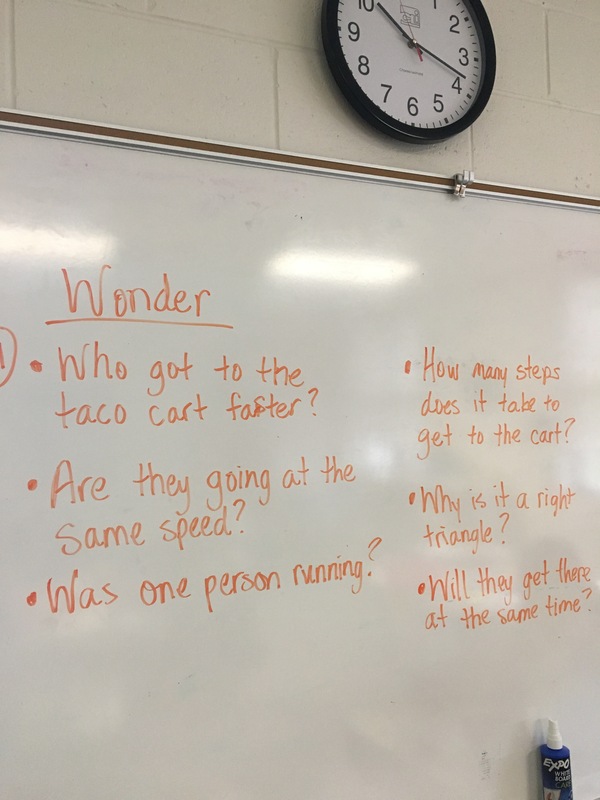 As with most 3 act tasks, this one began with the notice and wonder component. 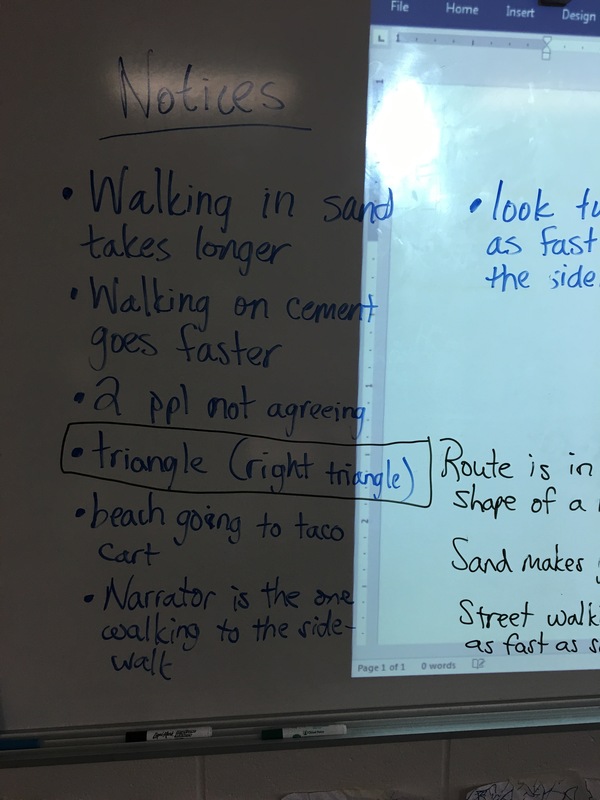 Students’ ideas exceeded what I expected. 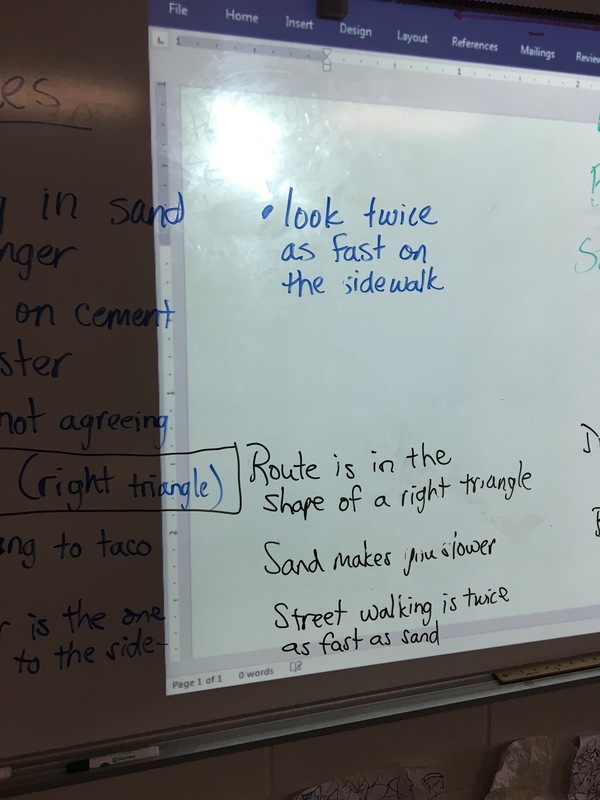 The blue notes the notices, the orange notes the wonders and the black were thoughts added during our discussion about estimations. 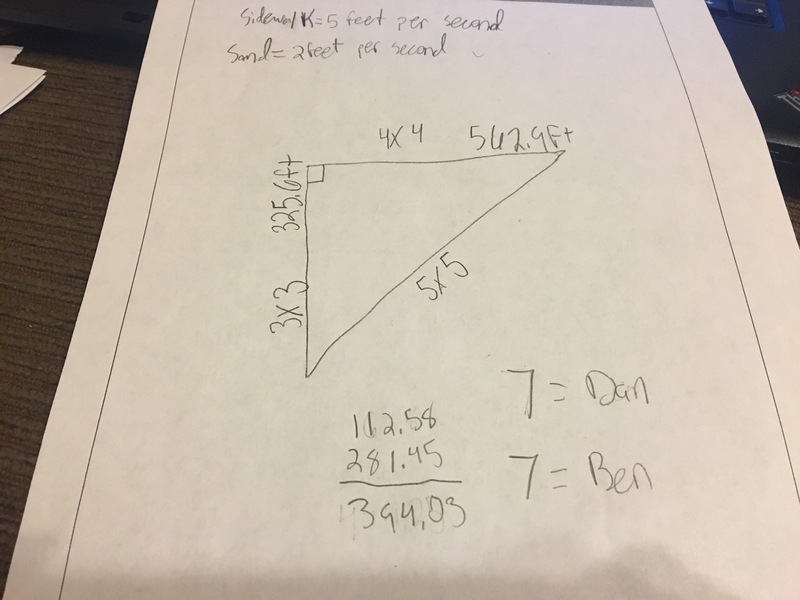 ​To prove our theories we used anglegs and color tiles to mimick the right triangle created by the path Ben and Dan walked to determine the length of the legs using the length of squares. 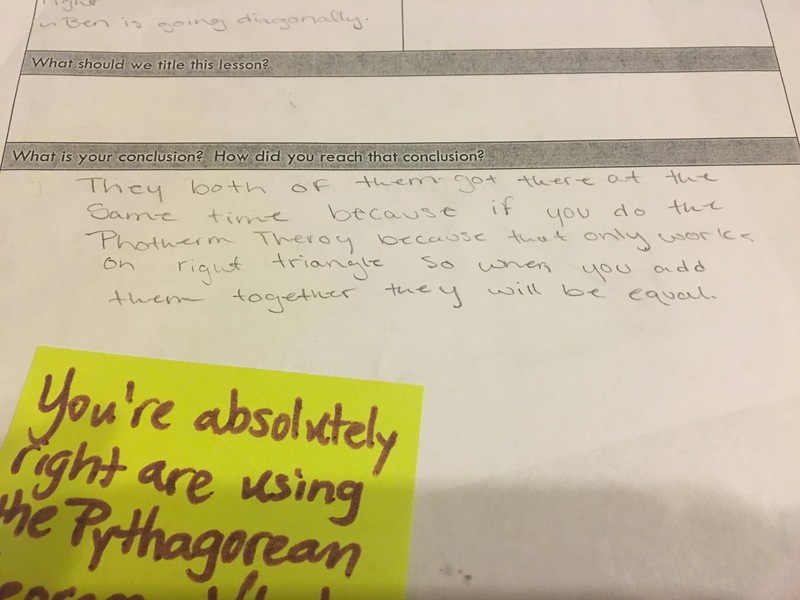 Even as we were building a student kept repeating, “there has to be a part 2 to this, there just has to be”. 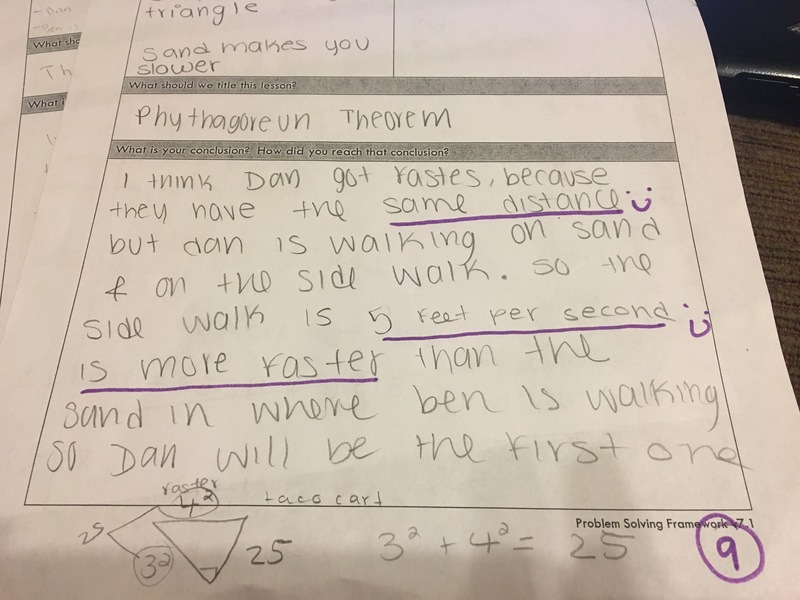 As students concluded the area of the legs combined or the path Dan walked was the same as the area of the square on the hypotenuse or Ben’s route, the excitement grew even more. Many thought their estimation of the guys getting to the cart at the same time was correct after the hands on activity. Others held on to the fact that time would play a key role in who got there faster. So I revealed the information for part 2. 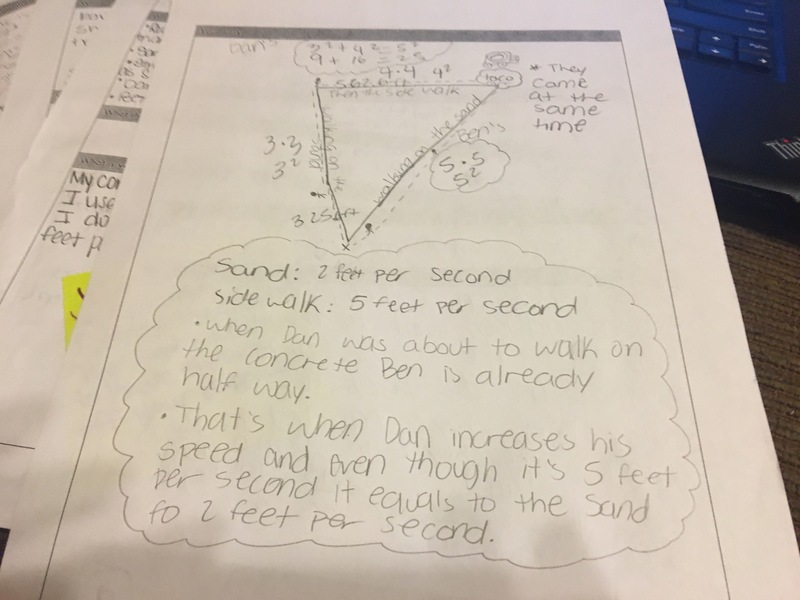 I love that many students had already developed a rate for the sidewalk to sand speed. 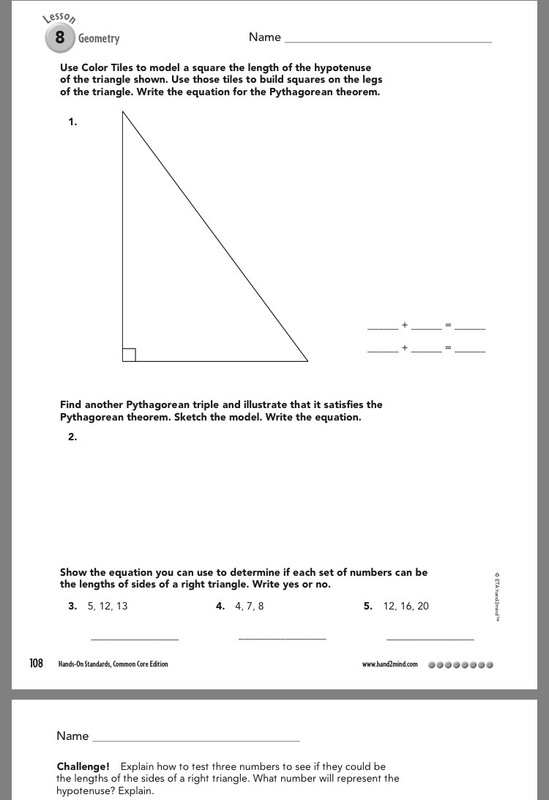 Those who shared their conjectures believed the rate was 2 to 1. 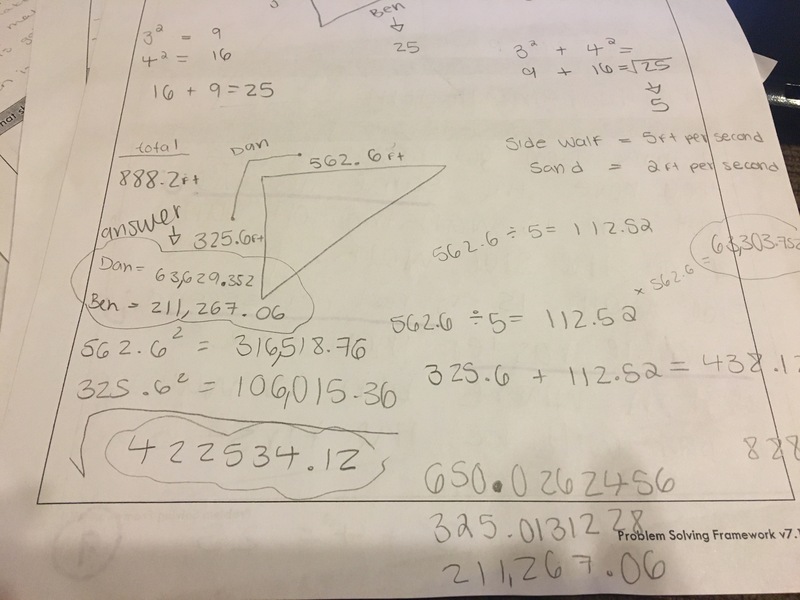 From the provided information it was determined it was 2.5 to 1. Then I decided to press the pause button on the task. 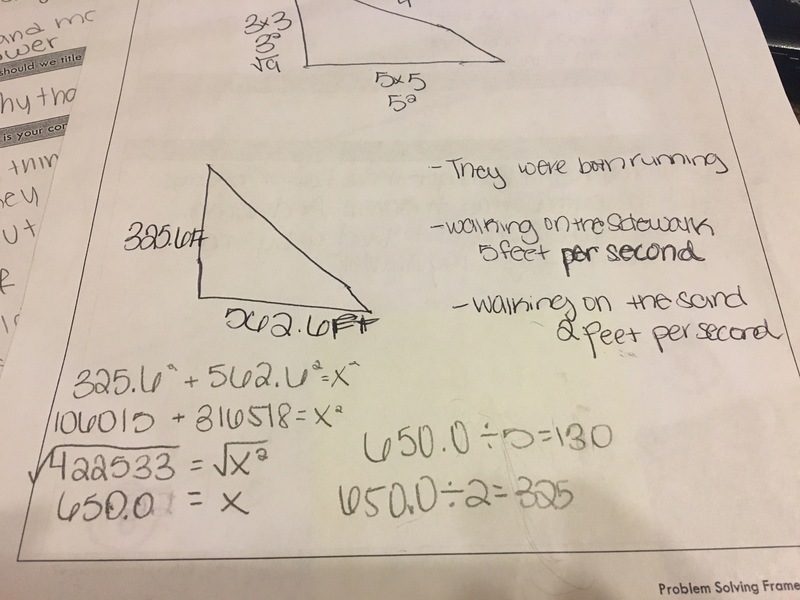 After students recorded the speed and distances provided on their recording sheet, I instructed them to put the papers in their porfolios to which a student exclaimed, “I know you are not about to do this to us!” Can you say completely hooked?! 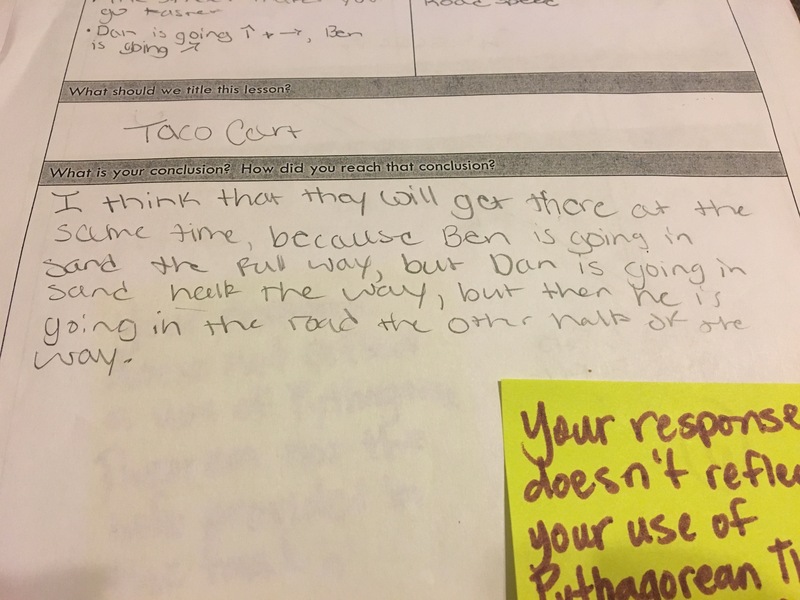 The next day, students came in asking, “Are we doing Taco Cart today? !” Each time I told them, “No, but I promise we will finish it this week.” The suspense grew and grew. Everyday they came in asking the same question. 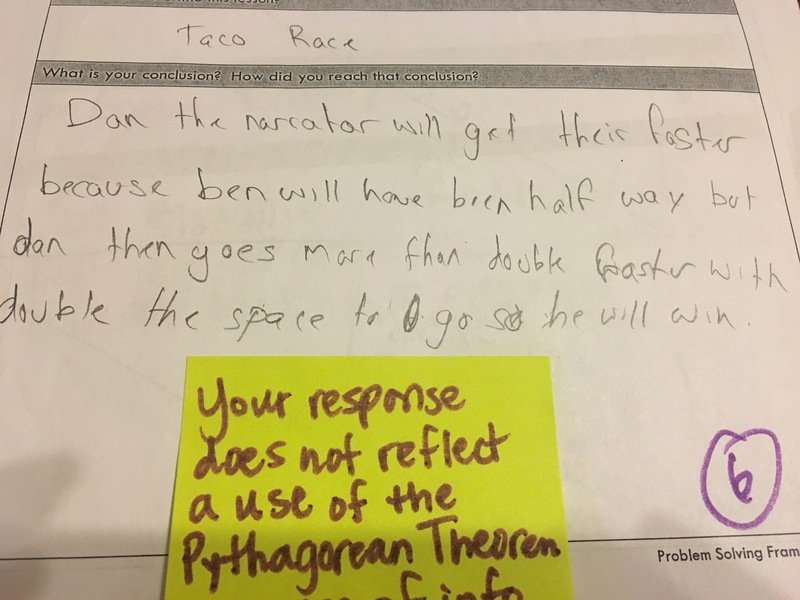 We worked through a few more concept development tasks from the GA Math Frameworks before returning to Taco Cart on Friday.